Expansion-Type Speed Nut Fasteners provide fast, vibration-resistant attachments in blind or center- panel locations where only one side is accessible. They snap easily into square or round holes and are self retained by spring legs. 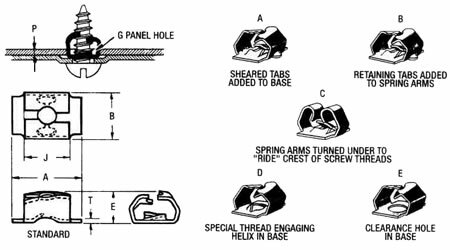 Special locking tabs are provided where permanent fastener retention is desired.As the screw is driven, it expands the spring legs, locking them over the panel thickness and at the same time providing a double-locking action on the screw. These easy to apply fasteners require no special sills or equipment to insall, can be used in place of weld-, clinch- or stake-type fasteners. Applied before or after painting, they will not clog - do not require masking. And, they can be safely applied after procelainizing.